Celebrate Local Traditions - Tamales, Bull Riding and More! One of the most obvious reasons to take a vacation is to escape the cold and enter paradise. December marks the time of year that Costa Rica is transitioning from the rainy season to their dry season. This always comes with a nice refreshing breeze. The temperature is perfect for the beach. So, jet-set out off the cold weather, stop shoveling that snow, and escape to paradise! Getting to know and experiencing the local traditions is a great way to soak in the culture of Costa Rica during your trip. To escape the cold, it’s a great idea to consider spending Christmas in Costa Rica with some of our holiday packages. You can enjoy various cultural activities such as topes (traditional horse parades), splendid holiday food, and the Festival of Lights. Around the time of December and January, you can also experience other local traditions as practiced by Costa Ricans such as bull rides and the street parties they organize around the popular festival known as Zapote. In Costa Rica, school is out of session throughout December and January. This allows kids to enjoy their “summer break.” Every December, Tico employees get a government-mandated yearly bonus that is equivalent to one month’s salary. With extra money in their pockets, Costa Ricans take advantage of their vacation time to do some serious holiday shopping. Families often gather to prepare special Christmas meals. It’s true hotels do get packed this time of year. However, My Costa Rica has blocks to guarantee space for this busy time of year. Every store and street are adorned with twinkling lights and nativity scenes, and families often gather to prepare special Christmas meals. Every year, millions of spectators gather in San Jose’s Paseo Colon to enjoy the magical Lights Festival. Typically held on the second Saturday of December, the festival includes a huge parade with elaborate floats, hundreds of thousands of lights, music, dancing and fireworks. Costa Ricans, especially in more rural areas, are devout Catholics, like most other parts of Central America. When you travel to the more densely populated areas like San Jose and Liberia, you will find that Christmas is a commercial holiday followed by a family gathering like it is for us. But off the beaten path, Costa Rica has more pious traditions and a religious holiday is seen as just that…a religious holiday. For some, this may be a welcome relief from the materialism celebrated in many other countries throughout the world. In fact, during the week of Christmas, it’s a tradition for each neighborhood to organize the children to re-enact Joseph and Mary looking for a place to stay. This is a tradition that flew over from Spain and Mexico and is called Posadas. They walk through the neighborhood, one little girl dressed as Mary and a little boy dressed as Joseph, knocking on doors, asking for lodging. The parents are behind them reciting bible quotes, and afterward, the neighborhood engages in a religious discussion. 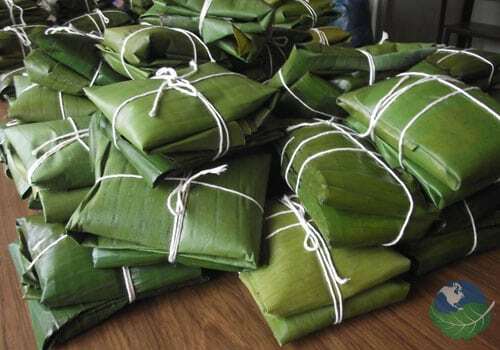 A popular Central American Christmas tradition that often extends to the rest of Latin America, is the “portal”. This is a nativity scene constructed of moss, colored sand and figurines representing the birth of Jesus. The traditional figures are Mary, Joseph, the three wise men, the ox and mule and shepherds and of course the Baby Jesus. The figure of Baby Jesus is placed in the “portal” at midnight on December the 24th. In Costa Rica, it is actually believed that the Baby Jesus delivers the presents under the tree and not Santa Claus! The Christmas-time Costa Rica Cuisine is quite frankly delicious and differs from the usual traditional food consisting of rice and beans. The queque navideño, a decake, full of rum-soaked fruits and raisins. Homemade tamales are another favorite and each family seems to have their own recipe. And the holiday drink of choice is rompope – the Costa Rican version of eggnog that is also fortified with plenty of rum. In addition to the Festival of Lights, you can also experience Tico-style bullfights, and carnival rides. These festivities start right after Christmas day when Costa Ricans descend on the Zapote Fairgrounds in San Jose for hours of entertainment and general merriment. The Tico Style bull fighting differs from the Mexican or Spanish ones in that it is a non-lethal tradition. The bulls are not killed but only teased and provoked. The bull fighting and the use of animals in other Costa Rican traditions have been creating quite a lot of controversy in recent years. There is a large rift that formed between those who support animal rights, and those who support traditions. Another highlight, is the country’s national horse parade, or Tope Nacional, held in San Jose on December 26th. Thousands of cowboys show off their horsemanship and fancy trotting skills. The hot, muggy weather of the rainy season’s replaced with dry cooler temperatures of about 70 degrees in December. With forecasts of blue skies and refreshing “Christmas winds”, many people stuck in the snow-covered north should seriously think about spending the holidays in Costa Rica!